beginning of the night Francois, Hitesh and Darragh did some tests with SPIFFY. team of helpers went up to the CCAS to check the mirror alignment with spiffy. a tracker error during the last observation and closed up after that. - Did not open, strong wind, high humidity and cloud. - Cloudy night, didn't open. - Night claimed by rising humidity. No data. Rho-dependent image quality with ~1.4-1.6 arcsec stars. light when I was last up.
. Did not open due to bad weather: rain and completely cloudy. before we could take data.
. Closed all night due to clouds.
. No data tonight. Too cloudy to get anything worthwhile for IQ. As part of some work to determine the data storage requirements of SALT, I went through all of the old observations and calculated the amount of data that has been observed. 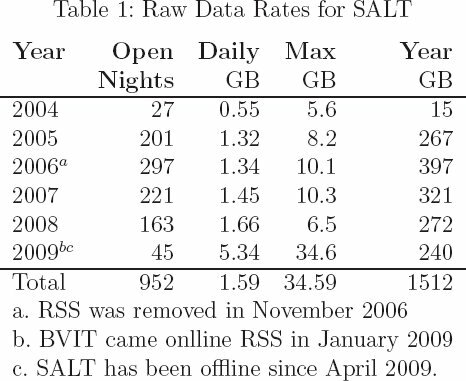 I've compiled the average daily rate of raw data per open night of observing along with the total amount of raw data per year of SALT operations. 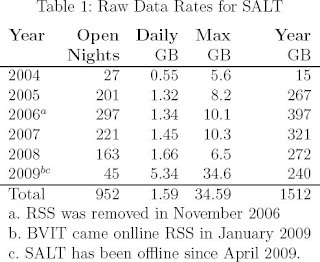 For 2006, SALT was operating near maximum efficiency and produced nearly 400 GB that year. During 2006, both SALTICAM and RSS were operating on the telescope, and below, I have the break down of how much data each instrument were producing. Once again, the table has the daily rate of raw data per open night and the total amount of data, but it also has the maximum amount of data taken during one night of observing for that instrument. In 2009, we also had a guest instrument, BVIT, that was producing a large amount of data even during the short time it was available at SALT! then high humidity & low T-dp. High winds (>60 kph) and dust precluding opening, though it was clear. moderate to poor seeing (TimDIMM ~2"), but got a little better at times. consistent and uniform over FoV. Some nice long tracks of SMC with nice uniform IQ. to be generally higher phi (~50") than the canonical (10"). due to being at ground level). Conditions very stable all night. comms. error and BMS deciding to close the louvres. middle part of CCD (i.e. mostly offset in altitude). from 1.5-2" throughout night, which was consistent with DIMM. Many repeat focus, phi, theta variations. Loads of data. All looked very repeatable, uniform and no hint of field dependencies. Clear at sunset. wind SE and R.H. incr from 45%. Initial hiccups with getting CCAS (datasocket issue?) going. Incr. humidity, dew point & ridge cloud killed us. flux distribution over the VI stage. put the Apogee camera back. They did a good job of centering the camera. 2'' for most of the night. - Lots of pointing tests during the night, see notes and comments below. - Could not test IQ because of bad conditions.